Hypercalcemia is a relatively common disorder, which requires specific treatment in order to control symptoms and prevent the development of organ damage. Since primary hyperparathyroidism and malignancy are responsible for more than 90% of all cases of hypercalcemia, greater interest was given in terms of developing the best strategy to manage these two critical situations. The aim of this book is to present up-to-date knowledge on hypercalcemia, its association with renal disorders, and benign and malignant diseases, diagnostic methodologies, as well as surgical and medical treatment. Insights into the etiology, pathogenesis and pathophysiology of hypercalcemia are included in the first four chapters, also providing comprehensive descriptions of clinical features, diagnostic and treatment procedures in the specific diseases associated with hypercalcemia. 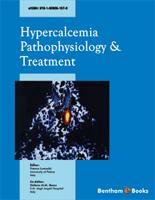 The other chapters present details on biochemical findings and ways to monitor complications and therapy, giving suggestions on the current imaging techniques, and deal with the criteria, procedures and results of surgical treatment of hypercalcemia, including unilateral and minimally-invasive parathyroidectomy. Finally, a specific chapter describes the pharmacology of anti-hypercalcemic drugs, also providing information on new drugs and future perspectives. Uniquely, this book will serve as a complete reference source for oncologists, nephrologists, endocrinologists and other clinicians, as well as for biochemists and pharmacologists, and all those involved in hypercalcemia management and research. Changes in serum calcium concentration regulate several fundamental cellular events, including enzy-matic activities, and cell membranes excitability. In adults 99% of calcium is found in the skeleton, in which it plays both structural and regulatory roles. High blood calcium levels (hypercalcemia) is extremely rare under physiological conditions. It usually occurs when parathyroid hormone (PTH) and 1,25 (OH)2 vitamin D act on osteocytic osteolysis and osteoclastic resorption, transferring calcium to the extracellular compartment. Basic mechanisms regulating calcium metabolism have long been defined, but the complete role of new factors, such as fibroblast growth factor-23 (FGF-23), transient receptor potential cation channel, subfamily V member 5 (TRPV5), and the Klotho gene, is still under study. The main causes of hypercalcemia are primary hyperparathyroidism (HPT), and malignancy-associated hypercalcemia (MAH). Severe or prolonged hypercalcemia may cause several complications, mainly depending on serum calcium concentrations. In any case, the clinical features are usually aspecific, such as muscle weakness, fatigability, asthenia, as well as signs and symptoms of dehydration. Other less common causes of hypercalcemia include increased intake of calcium and vitamin D, granulomatous diseases, other endocrine disorders, multiple endocrine neoplasia, familial benign hypocalciuric hypocalcemia, and other rare disorders. The therapy of choice for HPT is the surgical ablation of the hyperfunctioning parathyroid tissue, and the best time to cure a patient is during the initial phase. In patients with primary HPT, parathyroidectomy produces a sudden modification of the endocrine balance which regulates the calcium and phosphate metabolism. Currently, minimally invasive parathyroidectomy is widely performed, both videoassisted and radioguided. Physiologically, PTH acts directly on the renal and bone cells, and indirectly it influences the intestinal absorption of calcium, stimulating the renal synthesis of [1,25(OH)2]D3. Although there is an immediate renal response to serum PTH levels, The modifications which take place in the bone are slower, according to the particular way of the bone-remodeling process. The antireabsorptive action of bisphopshonates has been considered the most effective in the disorders characterized by an excessive bone resorption. Unfortunately, patients with MAH have usually advanced tumors which explains short survival rate. However, when the first diag-nosis is a chemosensitive tumor, such as multiple myeloma or metastatic breast cancer, long-term remissions may be obtained. Calicimimetic drugs and humanized monoclonal antibody against human parathyroid hormone-related protein represent the new drugs useful to treat hypercalcemia. Serum calcium has a pivotal role in the homeostasis of an organism, and its alteration has important effects. Knowledge of role and regulatory mechanisms of serum calcium is crucial to understand and diagnose the underlying diseases, that cause hypercalcemia. This book is a compilation of the efforts of a selected group of well-established experts in the field of calcium metabolism, and management of the causes of hypercalcemia. It summarizes the principle findings and points out possible pitfalls in hypercalcemic diseases, with the aim to help both students in the understanding and clinicians in their approach to patients with hypercalcemia. We would like to thank Director Mahmood Alam and particularly Assistant Manager Asma Ahmed, together with the whole Bentham Science Publishers, for their effort and support. Stefano M.M. Basso, M.D., Ph.D.